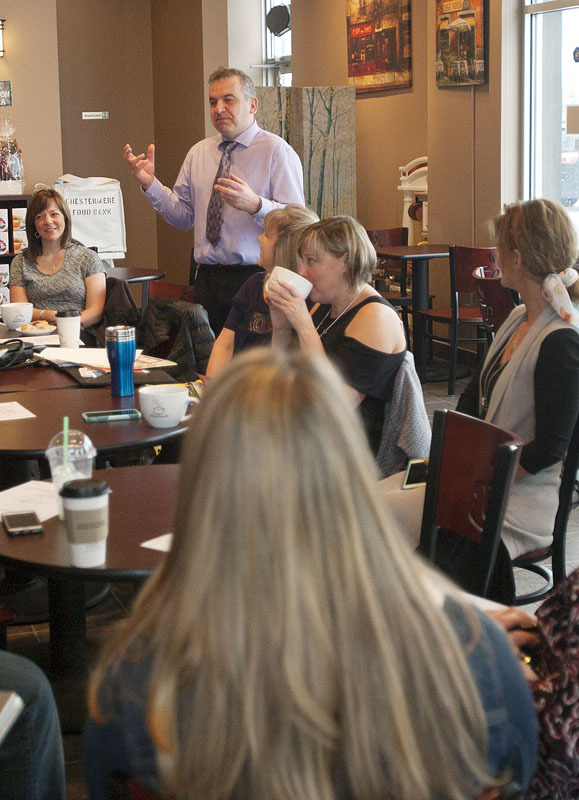 By bringing Chestermere’s business leaders together over coffee, Chestermere Area Networking (CAN) hopes to help them make connections, and find solutions and opportunities they might not otherwise find. “It’s not about having to necessarily do business with each other it’s about knowing that we can share this information with other people,” said CAN organizer Melodie Kindret. CAN events are co-organized by Kindret and Carla Lomenda. The group has been working to connect local businesses since 2014. “When I got involved, there was lots of businesses and it was a great way to network with people,” said Kindret. The aim of the group is to help get local businesses names out there and be better known in the community. Members of the group believe that word-of-mouth endorsements can be better than most other forms of marketing. “If we just keep including more people and grow our group we’ll continue to spread the word to other businesses that we’re here,” she said. Businesses from Langdon, Rocky View County, Strathmore and Chestermere are invited to attend the meetings. Participation with CAN has worked for Kindrat who is a Financial Advisor. “The networking does work,” she said. The morning meetings are held at the Waiting Room Café in Kinniburgh at 8:30 a.m. on the third Thursday of the month. They consist of round table introductions of everyone present, a guest speaker and finishes with a round table discussion. Kindret said they have found that having a speaker helps to keep the meetings focused. Since 2014 the group has seen several changes. “We moved the location just to see if we could attract more people,” she said. They have also gotten rid of the annual fee to join the group. Kindret said that anyone with a business who wants to connect with their peers is welcome to attend the event. CAN has been growing and the organizers are constantly looking for feedback from members of the group on how to improve the monthly meetings. CAN events start at 8:30 a.m. at the Waiting Room Café. Next month’s is scheduled for April 20. Kindret said that based upon the feedback from the March meeting they will try and get a social media marketing expert in to speak at the April meeting.